while flipping through lucky a couple months back, i stumbled upon this this necklace from guess for $35. it seemed like a reasonable price, but i tore it out anyway - seeing if i could make it happen for myself or find it even cheaper. then a couple of weeks ago i was looking through etsy and found these fun enamel chains, it seemed that they would make a fun braided necklace like the one i saw in lucky. i still really like the silver & am hoping to make a second or third version out of vintage chains & a more polished one from bulk chain at my local bead shop. this turned out to be a super simple, 30 minute necklace; one totally worth making. the chains ran me $16 & i had to pick up some beading supplies for the closure (could be done as cheap as $5). with that said, here's how to do it. double each 5 foot chain and mark each with a paper clip. make sure that each chain is of varying length. combine all 3 paper clips with the fourth paper clip. pair off chains & braid tightly for 7 inches. straighten a paper clip and run through all 6 chains. lay the full necklace out on a flat surface, match up each end up the chains. form the chains into an oval, draping into the ideal shape. keeping the draped section in tact, straighten a paper clip and run through the 6 chains where you'd like to start the second braid. pair off chains and braid loosely until the end of the chains. i left a chain or two hang, skipping some braids. finish off the necklace by threading the chains with a final paper clip. to add a closure i followed directions from an associate at my local bead store, so these might be a little rough. first i cut about 5 inches of 20 gauge wire. using a pencil i shaped a loop in the center of the 5 inches, pulled the loop open & turned on end into a 90 degree angle. i then threaded the end of the chains, and closed the loop. then using needle nose pliers i wrapped the side bent to a 90 degree angle around the other side 3 times. forming another hoop, i then threaded in the clasp. wrap back down once or twice, clip each wire tight. use the needle nose fliers to tighten the wrapped wire. repeat 10-12 for the other end of the necklace. i added a medium sized glass bead between the loop for added interest. 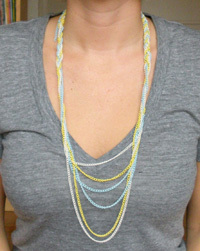 clearer instructions for finishing the necklace (steps 10-13): witty living, ehow with kathleen wright, and about.com. click here for process photos. please feel free to email me or leave comments with any questions or suggestions you might have on this tutorial, i always love to hear from you. wow I LOVE this! thanks for the tutorial, you always have such great ones! I am definitely going to make one of these necklaces!! I just saw an incredible braided chain at the RockandShop in Durham this past weekend on one of the shoppers - now this tutorial. Great timing and now off to make one! I love this idea! Thanks for sharing. I will link in an upcoming post.